One of the more reliable crops for POD has always been chard. This year, magically, we managed to plant the perfect amount. Six plants per square foot (for a total of 12 plants) have kept this little family, and our neighbors, comfortably fed with crisp, brilliantly red chard. And, a bit surprisingly, it’s turned into on of the Hurricane’s favorite veggies. Upon seeing a pile of chard in the Endurer’s motley summer salad, she plucked up a fork and snatched a few off his plate. 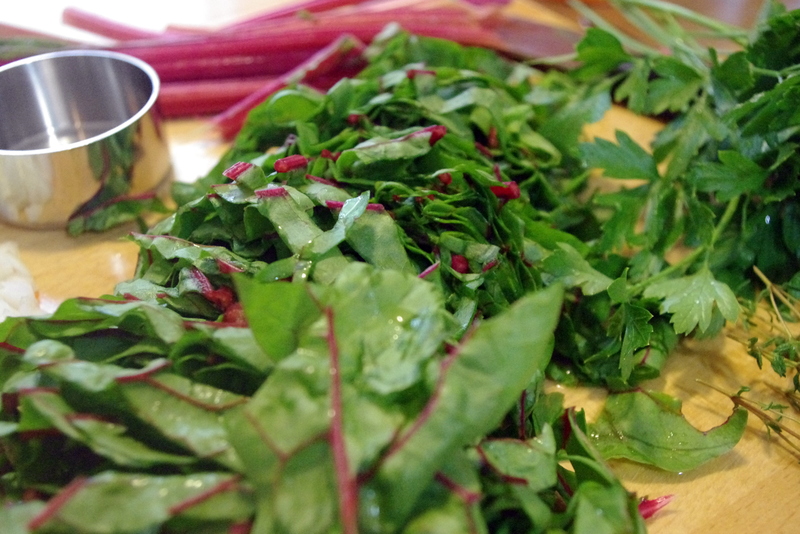 Last year’s hit, Swiss chard goma-ae, has been trumped by a couple of new recipes. Enjoy. This recipe is brought to you courtesy of the wonderful and envy-making (the book I would hope to write were I a far better writer, gardener, and cook) Tender, by Nigel Slater. If your passions are evenly divided between your harvest and your snug kitchen, you must add this book to your shelves. It’s so satisfying to wander out the back door and gather a basket brimming with chard, parsley, and mint. This is a man who looks at his bounty and puts it to noble use. Peel the onion and chop it finely, then let it soften in a deep pan over medium to low heat with a little olive oil. Peel the garlic, slice it thickly, then add to the onion with the chopped bacon or pancetta. Chop the parsley and stir it in. Wash the card thoroughly, set aside four beautiful stalks and their leaves, then separate the remaining stalks and leaves. Chop the stalks coarsely and set the leaves aside. Add the chopped chard stalks to the onion and bacon and continue cooking. Tear the reserved chard leaves up a bit. Stir them into the soup. Steam the reserved whole leaves and stalks until tender. Season the soup with salt, black pepper, lemon juice, and the mint leaves, tasting as you go. Ladle the hot soup into warm bowls, add the steamed chard, and serve with more lemon and mint for those who want it. In a medium saucepan, combine 2 cups of stock and 2 c. water with the farro and salt (the stock is optional, but it adds a nice depth to the dish). Bring to a boil over high heat. Cover and simmer over medium-low heat until the farro is almost tender, about 20 minutes. Drain well (the remaining liquid can be saved for your next batch of farro). Transfer to a large bowl and let cool. Meanwhile, bring a medium pot of salted water to a boil over high heat. Add the green beans and chard. Cook for 2 minutes. Transfer the cooked green beans and chard to a bowl of ice water and let cool for 2 minutes. Drain the green beans. Once the farro has cooled add the green beans, chard, olives, red pepper, Parmesan, and chives. Stir to combine. In a small bowl mix together the sherry vinegar, olive oil, mustard, pepper, and the remaining 1/2 teaspoon salt. Stir to combine. Pour the sherry vinaigrette over the farro salad. Toss to combine and serve.